It seems like only yesterday that we were high-fiving each other after last year’s magical festival. The Independent declared that it came “close to stealing Glastonbury’s crown” and it was voted ‘Best Festival’ by BBC 6 Music Drivetime listeners for the third year running, plus we won ‘Best Line-Up’ at the UK Festival Awards . Now we’re back in business and pleased to announce two of 2017’s headliners, along with many more phenomenal bands and performers. WATCH OUR ANNOUNCEMENT VIDEO NOW! Tier 3 tickets are now on sale at £179, with no booking or transaction fees. Grab yours now! Father John Misty will make his first ever UK festival headline appearance at End Of The Road. Since 2012, Joshua Tillman has emerged as a singular and idiosyncratic voice. With his polarising witty lyrics, his ‘intimately berserk’ live performances, and with a new album Pure Comedy due in April, we can’t wait to see what he has in store for the Woods Stage. Next up, Mac DeMarco returns with his delicately demented pop to play his only UK festival this year. Last seen presenting us with our tenth birthday cake on the Garden Stage before staging a full on cake fight, to say that we’re excited to have him all to ourselves is a massive understatement. We’re honoured that multi-Grammy award winning Americana legend Lucinda Williams will be bringing her pioneering songwriting to Larmer Tree Gardens for the very first time. Following the universally acclaimed 2016 album The Ghosts Of Highway 20, End of The Road is the only festival where you will hear her spellbinding songs brought to life. Following Lucinda Williams’ lead will be rising country star Courtney Marie-Andrews and Julie Byrne’s startlingly beautiful voice will surely bring the festival to a standstill. Acclaimed newcomer Japanese Breakfast brings her blend of dark lyrics and blissed out pop melodies while Let’s Eat Grandma will keep things weird! Ty Segall returns this year! Not one for half measures, his live show is an over-the-top howling assault on the senses that is as gloriously bewildering as it is exciting. Fellow punks Parquet Courts, who kindly provided the soundtrack to our excellent launch video, also make their second appearance at End Of The Road following their breathlessly exciting show in 2013. We are proud to say the 2017 line up is also filled with thrilling new artists, including Car Seat Headrest whose recent album Teens of Denial is a heady mix of introversion and aggression, vulnerability and playfulness. Live he covers everyone from The Cars to Frank Ocean, as well as ripping through his own original material. California indie duo Foxygen will play for us at last. Their long awaited new album Hang features contributions from the Flaming Lips’ Steven Drozd, Matthew E. White, The Lemon Twigs and more. Speaking of The Lemon Twigs … the ultimate critics pets have gone from playing New York bars to receiving praise from as far and wide as the Zombies to Questlove. 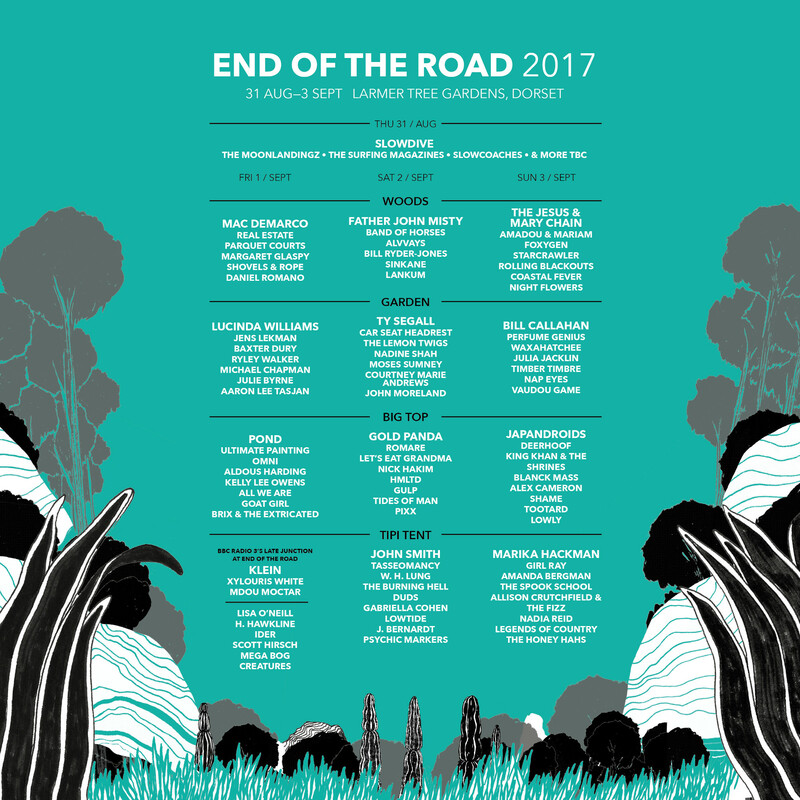 They’ve already played with Foxygen and Car Seat Headrest, so we’re happy to keep the gang together at End of The Road 2017. We are extremely excited to reveal more of this year’s line up, including our third headliner… Mr Bill Callahan. We have long wanted the ex-Smog man to play among the magical surroundings of Larmer Tree Gardens, so we are utterly thrilled that the seminal and singular songwriter will be joining the already exceptional line up, including Father John Misty, Mac DeMarco and Lucinda Williams, for his only UK festival appearance this year. Tier 4 tickets are now on sale at £189, with no booking or transaction fees. Grab yours now! We are also thrilled to announce shoegaze legends Slowdive – whose first album in 22 years is due out in May – will be joining us to headline the Big Top on Thursday night. They will be joined on Thursday by The Moonlandingz, fronted by two of Fat White Family – with Lias Saoud, proving a fantastically acerbic front man, perpetually on the verge of either collapse or combustion. They have to be seen live to be believed. We like to keep things in the family at End of The Road, so this year we not only have the critically lauded Waxahatchee – AKA Katie Crutchfield, unofficial leader of the DIY indie punk scene – we also welcome her supremely talented sister Allison Crutchfield. Both are renowned for their captivating live shows so we’re very excited to have them both play at this year’s festival for the first time. Also joining us for the first time we have the sublime Moses Sumney. We’ve been a long time fan since his star turn on Beck’s Song Reader – his version of “Title Of This Song” was a standout among many established artists who contributed, his voice being one of those remarkable instruments; rich gorgeous and effortless. 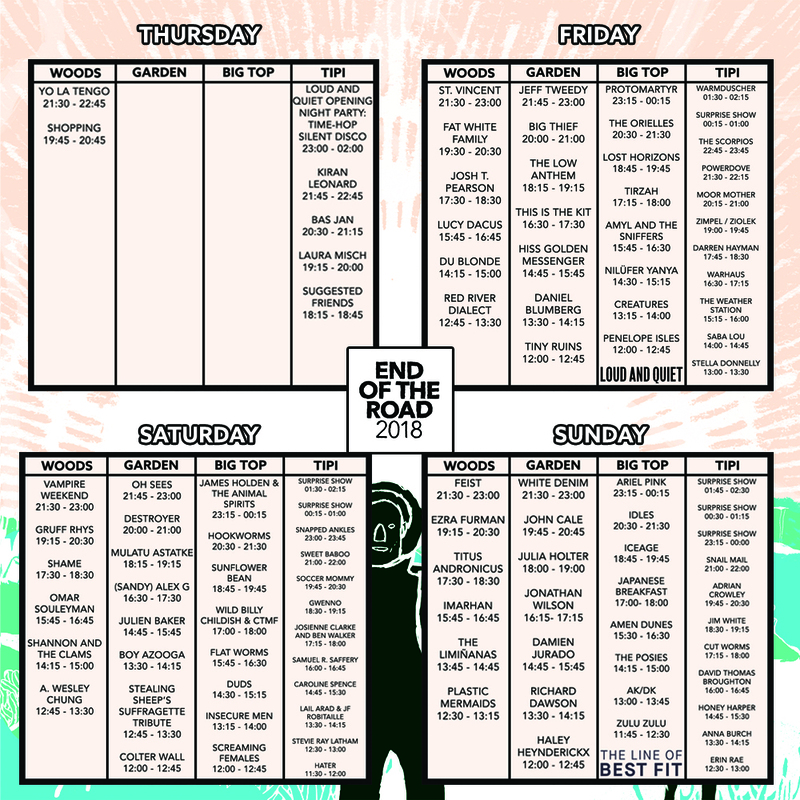 Always one of the highlights of the festival scene, this weekend will see the 11th edition of End Of The Road. The festival, set in the beautiful Larmer Tree Gardens, continues to showcase the best in Americana, folk and basically anything they like the sound of, and this year’s line up might just be one of the best yet. 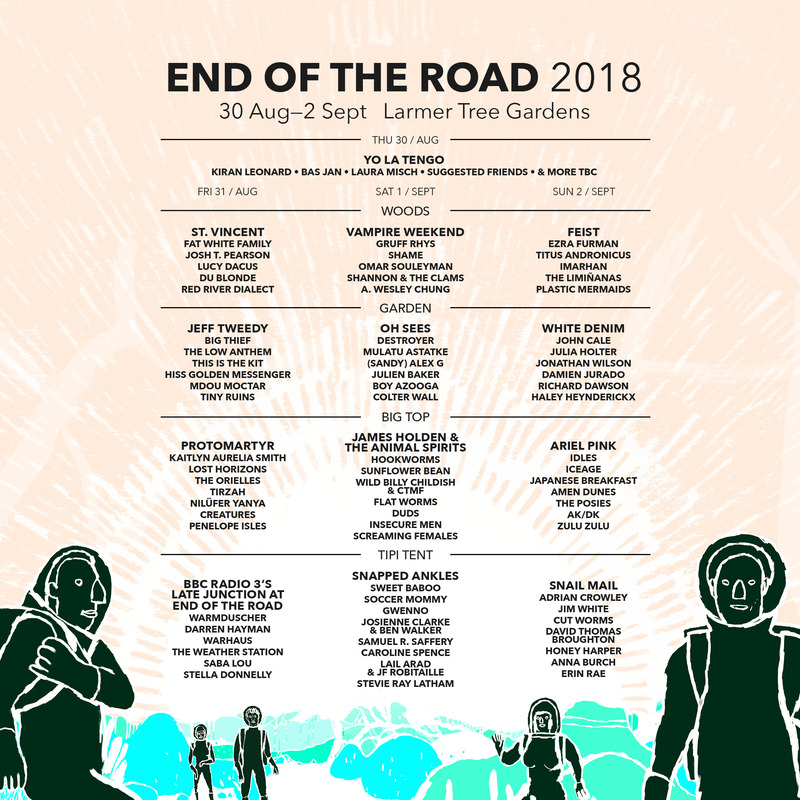 Joanna Newsom, Bat For Lashes and Animal Collective are set to headline this year’s End Of The Road festival. The festival, which takes place at Larmer Tree Gardens in Wiltshire, is consistently one step to the left of its peers when it comes to line-up and headliners – and this year is no different. Alongside those three brilliant headliners (and this’ll be Joanna Newsom’s only UK festival date), Cat Power, Goat, Phosphorescent, Shura, Dilly Dally, The Big Moon, Field Music and many more are set to perform. It’s going to be a magical weekend, and not just because of the exceptiona Headliners including The Shins‘ first show in four years, plus the only chance to see the dazzlingly talented Joanna Newsom in the UK this year, the Technicolor genre-hopping Animal Collective and the otherworldly Bat for Lashes – as everyone who has been to End of The Road knows, it’s all about the new discoveries and secret performances. Who will be popping up at the Piano Stage or singing on the Disco Ship? Anything could happen… Including one more headliner still to be announced for the Big Top on Saturday night, who will be revealed on site! Mothers: Kristine Leschper, the creative force behind Athens-based indie band Mothers, is the most impossibly mesmeric frontperson. She orchestrates, acting as the fine balance between the twee-weaving and explosive chaos that dominate her band’s sonic blueprint in equal parts. “I don’t like myself when I’m awake” she croons on ‘It Hurts Until It Doesn’t’, the band’s cue to ramp up the reverb-heavy motifs and blast into a head-spinning outro of flailing guitars and raw emotion. Mothers headline the Tipi Tent on the Friday night. Younghusband: I’m delighted that EOTR thought to book London psych collective-turned-power-pop gang Younghusband, they’re a band too often overlooked by festival organisers. Their 2015 effort, Dissolver, saw the band team up with Bad Seed Warren Ellis to craft an effortlessly ornate collection of Big Star-indebted cuts essential to any festival. They may have shedded the psych freak-outs that brought them all initial attention, but Younghusband have morphed into an unstoppable force of power-pop freedom and organ-led melodic bliss. U.S. Girls: Meghan Remy’s warped pop project U.S. Girls play evocative earworms, projected onto funhouse mirrors and wrapped in an unsettled haze – and the results are breathtaking. Utilising feelings of discomfort and unease – in both sound and lyrical narrative – where other artists might aim for familiarity and warmth, U.S. Girls is a thrillingly unique (and often incredibly catchy) proposition and I can’t wait to hear tracks from this year’s wonderful/brutal Half Free launched into life. Sunflower Bean: There’s a propensity for heaviness reminiscent of Led Zeppelin accompanied by tender vocals about life and love similar to Shangri Las or something that make their set enigmatic as they take you down a psychedelic rabbit hole. Thee Oh Sees: With their unique brand of psychedelic garage rock .In turns face-meltingly fast and hauntingly subdued, the relentless rhythm section tightly interlocking with frontman John Dwyer’s macabre croon, with an enjoyable recorded output. This August’s A Weird Exits is their 11th album in 8 years. It’s a predictably strong record, and there’s no doubting that Dwyer and co will be rattling just as hard as ever when End of the Road comes around. Teenage Fanclub: It’s hard to think of a better way to say goodbye to EOTR 2016 than with a hits-packed set from Scottish indie rockers Teenage Fanclub. In an ideal world, the Bandwagonesque masterminds would be the most popular band in the world. They’re likely to grace the Big Top stage at around 11:15, and their myriad of indie pop anthems are sure to see out the festival on a massive high. Whether you choose Thee Oh Sees or Joanna Newsom before hand (and I’m not looking forward to making that decision), end your weekend dancing to some generation-transcending pop songs. As if that wasn’t enough, there are many delights to be seen and heard on this years Comedy Stage line up, lead by Bridget Christie following her well received show at Edinburgh Fringe, the inimitable Stewart Lee, alternative comedy hero Josie Long, acclaimed newcomer Lolly Adefope and Radio 4 regular Andy Zaltzman performing his Political Animal show. Other highlights include the legendary comedian and Comedy Club host Arthur Smith, along with comedy writer turned celebrity Masterchef Hardeep Singh Kohli, hugely respected and wildly popular Adam Bloom and Benedict Cumberbatch’s pal John Finnemore making his debut at the festival. Along with our usual stellar selection of workshops and activities taking place in the Wonder Lands and the ever impressive line up of Food and Drink on offer, including Beavertown taking over the Courtyard Bar this year, End of The Road is set to be one of the best weekends of 2016. and even the weather is expected to be fair all weekend. Not many people’s route to international critical acclaim takes in several years working on a factory production line making essential oils, but Australian songwriter, Julia Jacklin, isn’t most people. One of the joys of those years spent in tedious employment, was that it allowed Julia to hone her musical craft, to think of little but music, and how it was her ticket out of there. Born in the Blue Mountains, Julia’s music is surprisingly un-Australian, it nods in the direction of alt-country, a world of twanging electric guitars, smooth ticking drum beats, and her trump card, her spectacular vocal. More than just a wonderful voice though, Julia is also a superbly cutting lyricist, as she sings on recent single Leadlight, “I love you my darling, but I can’t promise I’ll be here to see this whole love through.” With a debut album out next month and seemingly every radio station and music rag queuing up to rave about it, don’t expect Julia Jacklin to be playing the smallest tent again anytime soon. Marika Hackman and Laura Marling played a short set at the piano bar at End Of the Road Festival Sunday afternoon. The pair sang ‘Tired Of You’ at End Of The Road, and Marika Hackman delivered a surprise Foo Fighters cover at a secret acoustic set over the weekend. The festival took place at Larmer Tree Gardens in Wiltshire, with the pair teaming up for a version of the US band’s song ‘Tired Of You’. The track was originally featured on the Foo Fighters’ 2002 album ‘One By One’. Ones and Sixes is currently available for pre-order and also on Bandcamp. The limited “Loser Edition” LP on yellow vinyl will be available while supplies last. For those who like to wear their music, two new T-shirt designs will also be available, either as individual items or as part of CD/LP bundles. Beloved slowcore pioneers LOW shared another new piece of their recently announced new record Ones And Sixes. The track is called What Part Of Me and marks the second impression after No Comprende. Ones And Sixes will be the follow-up to 2013’s The Invisible Way and arrives on Sub Pop Records on September 11th. The LP was recorded at Justin Vernon’s April Base Studios in Eau Claire, Wisconsin. Check out the tour dates . Tickets are on sale now for our North American and European Tours. We will be joined by Andy Shauf, Two Gallants, Mike Noga (The Drones), and Chelsea Wolfe. More information is available on our website, and we look forward to seeing you on the road. Low’s Ones and Sixes releases on CD / LP / DL worldwide Friday, September 11th. should they be your next favourite band The Districts are from the state of Pennsylvania,coming from a smaller town named Lititz this promising new young band with Rob Grote they have a perfect frontman and singer guitarist, you must check out this band they will be performing at “End Of The Road Festival” in Dorset. The type of voice you don’t hear very often and the exciting band that is St Paul and the Broken Bones, Paul Janeway and the band Broken Bones is a band you must see their talent and energy this band produce is enthralling.